For Only $10. You can join the thousands of Multi-Pure Independent Distributors who are helping the members of their community improve the quality of their water, while also helping prevent million of water bottles ending up in our ladfills. You are about to take the first step into the future of your dreams! If you have been searching for the perfect home business, you have found it with Multi-Pure! You are on your way to beginning a new lifetime lucrative career with a legitimate company who actually cares and wants you to succeed! Multi-Pure is a solid, trusted 40 year old company. 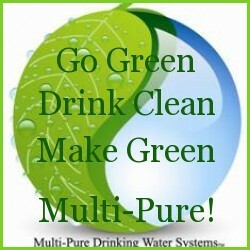 Multi-Pure Drinking Water Systems was founded in December, 1970, to become the premier manufacturer of high quality drinking water treatment devices that reduce a wide range of contaminants of health concern and provide the peoples of the world with the best quality drinking water available at an affordable price. Today Multi-Pure is an industry leader and the world's largest manufacturer of compressed solid carbon block filters. Multi-Pure is a member of the Direct Selling Association. We abide by the DSA's Code of Ethics. Earn an average of $100 per sale! With Multi-Pure there are no monthly fee's or auto ships, however, Multi-Pure does offer their distributors a personalized independent distributor website for $40 per year. (You may want the website if you are planning on marketing online.) Sample Website. So your total start up cost is only $50. All products are drop shipped directly to your customers from Multi-Pure headquartes and you get paid the commission! YOU DO NOT HAVE TO BE A WATER EXPERT TO SELL MULTI-PURE! We talk to a lot of new distributors who are a bit hesitant about talking to people about Multi-Pure because they're afraid they won't be able to answer customers questions about products or specific contaminants. When you first get started, you wont know everything about this business, but that's ok, that's what WE'RE here for! You have a whole team of Customer Service representatives, marketing experts, scientists, manufacturing directors, shipping managers, and more right here at Multi-Pure to help you find the answers! We're as close as a phone call: 1-800-622-9206. or you may call me at 954-614-7288, and we will do our best to answer all your questions! IMPORTANT: Your sponsors name is "Ginny Williams". You must put this information on the application form in the "how did you hear about us" box or Multi-Pure will not know who your sponsor is. Subject to the terms and conditions set forth herein, applicant hereby applies for Distributorship to Multi-Pure Corporation and agrees to read as soon as possible the guidelines and policies set forth in the Distributor Handbook and agrees to follow same. 1.The individual named in this agreement (hereinafter called Distributor) agrees to use his/her best efforts to promote the sale of Multi-Pure Corporation (herinafter called MPC) products in a manner favorable to Distributor and MPC. 2. Distributor serves as an independent contractor and as such is responsible for their own business; therefore, Distributor will pay all costs of marketing and distributing MPC products and agrees to hold MPC harmless from all costs. 3. Distributor's rights and responsibilities will be determined by the distributor handbook, website and other MPC publications. It is understood and agreed that the Company has the right to alter, modify or change the terms and conditions of this Agreement, including such items as discount level and commission provisions, at any time upon thirty (30) days prior written notice of such changes. Written notice of such alteration, modification or change may be given by the Company to the Independent Distributor by regular mail, e-mail, or by posting a notice on the Company's Web site. The Independent Distributor is bound by such altered, modified or changed terms and conditions as reflected in the most current Independent Distributor Agreement, or as altered, modified or changed, from time to time as permitted herein. No oral modifications, additions, deletions or exceptions to the Independent Distributor Agreement are permitted. 4. A distributor neither has to make a financial investment nor maintain an inventory. To become a Distributor of Multi-Pure Corporation a person must pay the Independent Distributorship Fee and agree to abide by both the Distributor Handbook provisions and the provisions of this Agreement. We recommend that each Distributor purchase their own drinking water system and consider having a few units on hand for immediate sales. 5. All applicants for Distributorships must be 18 years of age or older. 6. Multi-Pure is a trademarked name and may not be used by Independent Distributors for any purpose without prior written consent of MPC. All sales aids, brochures, literature, etc. are the property of MPC and cannot be reproduced without prior written consent of MPC. Distributors are encouraged to advertise and promote Multi-Pure products and Distributorship opportunities. All proposed promotions or advertisements must include only official Multi-Pure claims, logos, trademarks, etc. as shown in the official MPC literature and sales aids. Distributors must submit proposed advertising and promotional materials to the Multi-Pure Marketing Department for prior approval. 7. A Distributor may be terminated by MPC immediately if Distributor's actions discredit MPC or violate these terms and conditions, or if Distributor makes claims contrary to MPC's literature, labels, violates the provisions of the distributor handbook, or for other good cause. 8. Distributors accepted by MPC agree to comply with all governmental laws and regulations including Federal, State, County, and Municipal codes and regulations. 9. Distributors may sell Multi-Pure Drinking Water Systems and sponsor new Distributors anywhere within the United States and its territories and Canada. Distributors are not limited to or given exclusive territories or markets within the United States and its territories and Canada. 10.Distributors may not sell or sponsor in other countries. 11.Distributors will represent Multi-Pure products and Distributor Opportunity program completely and honestly without exaggeration to all potential customers and new Distributors. Distributors will not engage in deceptive or unlawful consumer practices nor make fraudulent claims about Multi- Pure Corporation, its products or its programs. 12.Personalized Multi-Pure web pages are available for Distributors to use subject to certain terms and conditions. Distributors may use Multi-Pure's trade names, trademark, logos, and copyrighted material in connection with Distributor's personalized Multi-Pure web page in compliance with all of Multi-Pure's rules. A Distributor may have a web site not affiliated with Multi-Pure's corporate site; however, use of the Multi-Pure? name, logo, photos, product codes, etc. requires written approval from Multi-Pure's Marketing department. Multi-Pure? in any form, with or without a hyphen, may not be used by an independent distributor as a key word or meta tag in connection with any internet service. 13.It is acknowledged that Distributor is not required to install the Multi-Pure Drinking Water Systems they sell. However, should Distributor choose to install units, they are solely responsible for their own installations and agree to hold MPC harmless from all costs. The MPC Warranty describes the extent of its liability. MPC shall not incur any obligation or liability for damages, including consequential damages, arising out of or in connection with installations of Multi-Pure Drinking Water Systems by Distributor. 14.Personal Activity Requirement (PAR) is a quarterly requirement which enables distributors to receive commission and bonuses on their active downline sales and filter replacements when they make a sale/purchase of a drinking water system valuing $165 every four months. You will receive downline commissions and bonuses in the month you qualify plus the next three months. 15.There are three types of distributors: 1) An "Active" distributor who qualifies for PAR. Commissions and bonuses are paid to the first ten active (PAR-eligible) distributors in a network. 2) An "Inactive" distributor is not PAR-eligible; however, commissions will be paid on personal sales, including personal replacement filter sales. 3) A "Dormant" distributor has not been PAR-eligible for 36 consecutive months and is permanently removed from the distributor database; however, you will remain on file as a customer. If you are a "Dormant" distributor and would like to become an "Active" Distributor, you may: a) Become a brand new distributor (Junior Builder) by paying the Distributor Fee or b) Reinstate your previous achievement level by paying the Distributor Fee and making a sale/purchase of a drinking water system valuing $165 in the same transaction. 16. (Arbitration) - Any dispute, claim or controversy arising out of or relating to this Agreement or the breach, termination, enforcement, interpretation or validity thereof, including the determination of the scope or applicability of this agreement to arbitrate, shall be determined by arbitration in Las Vegas, NV., before one arbitrator. At the option of the first to commence an arbitration, the arbitration shall be administered and governed either by JAMS, pursuant to its Comprehensive Arbitration Rules and Procedures, or by ADR SERVICES pursuant to its Rules of Procedure, NRS 38.206 et.seq., (Nevada Arbitration Law) as existing at the time of signing this Agreement, or as later modified or replaced. Judgment on the Award may be entered in any court having jurisdiction. This clause shall not preclude parties from seeking provisional remedies in aid of arbitration from a court of appropriate jurisdiction. The arbitration shall be held before a single arbitrator and shall be binding with no right of appeal, other than as permitted by then existing State Law. 17.I acknowledge I have read and accept the above terms and conditions for becoming a Multi-Pure Independent Distributor as indicted with my signature on the front page of this form. All official notifications, including modifications or any changes to this Agreement may be sent to the Distributor by email, or published on the web site in lieu of regular mail. $10.00 Registration Fee and Distributor Handbook. $29.95 Registration Fee, Distributor Handbook, Brochures, Forms, Dan Lier CD, Cut Way Filter, OTO Solution, 1 Magnetic Car Sign, Plastic Demo Cup, Better Way to Water DVD. $29.95 Registration Fee, Distributor Handbook, Brochures, Forms, Dan Lier CD, Cut Way Filter, OTO Solution, 1 Magnetic Car Sign, Plastic Demo Cup, Better Way to Water DVD-- Spanish. Fill out your information to complete your application! NOTE: You will receive an automatic e-mail upon completion of your application. After your acceptance into the Multi-Pure Distributor program, you will then be able to purchase your distributor website if you wish. Please allow up to 3 business days for processing. Remember...We are here to help you. NOTE: This distributor program is only available to USA And Canadian Residents. You will receive an automatic e-mail welcoming you to Multi-Pure. You will also recieve your distributor handbook and ID card in the mail. Please allow 7-10 working days. Welcome to Multi-Pure! You need to be a member of Multi-Pure Drinking Water Systems& Independant Distributors to add comments! Welcome to the group, Melissa and let me know if I can help in any way!